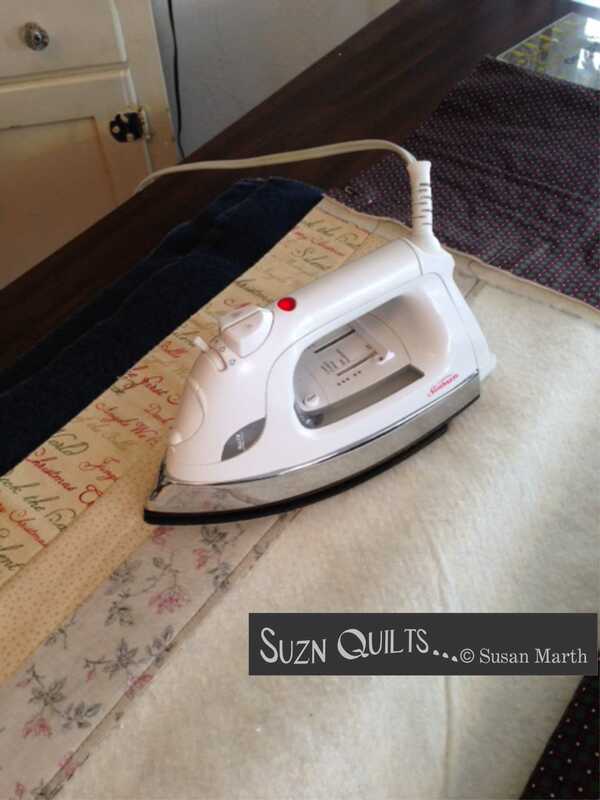 Finishing up a quilt project | Quilting my way through life! Last we were together I was up to my eyeballs in these. Aren’t the little piles of alligator teeth too cute? I was able to complete all of the half Tiny Dresden plates from the 1,600+ petals! the extra petals set aside for another project down the road. The little rows just make me smile! of Jo Morton’s New Hope by Moda Fabrics. 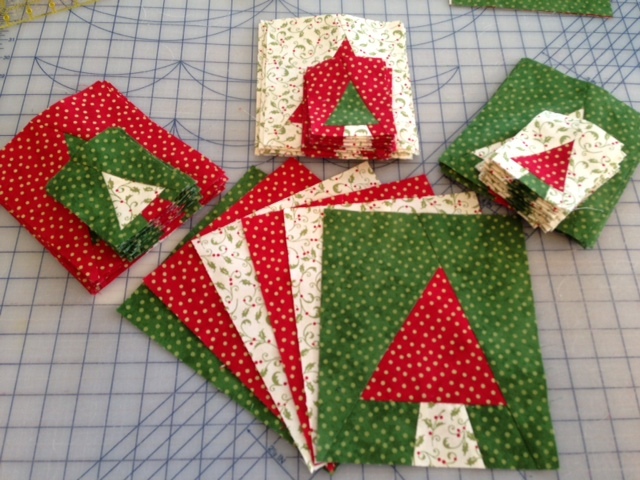 I got to work making blocks from the half Tiny Dresden plates for my next quilt. This is my work space all set up & ready to sew. My cute little Dritz Mighty Steam Iron showed up just in time to travel with me. It’s the perfect little Dresden plate iron!!! It’s extremely light-weight & just the right size for pressing my little plates. I wish I’d known about them sooner! I was so impressed that I’m now carrying them on my website for you to purchase here. Don’t let the small size fool you. It’s great for pressing small half-square triangles too. I also like it for pressing block parts. Love, love, love each step! I bought this pretty Barbara Brackman charm pack & two coordinating prints. This is what I had in mind. They’re fun to make & so darn cute! 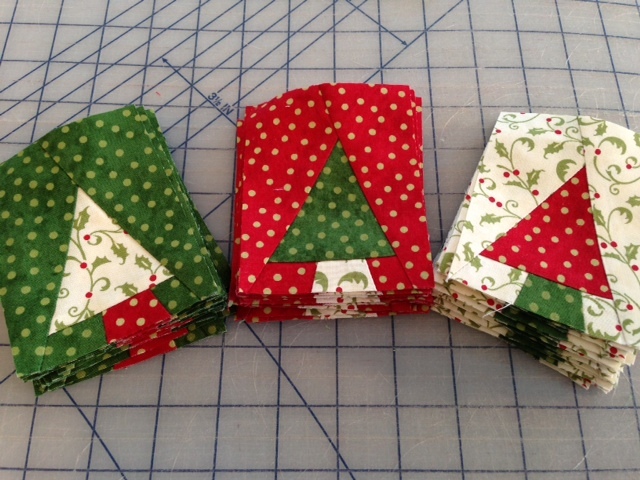 I cut the charm squares into fourths making 2-1/2″ squares. 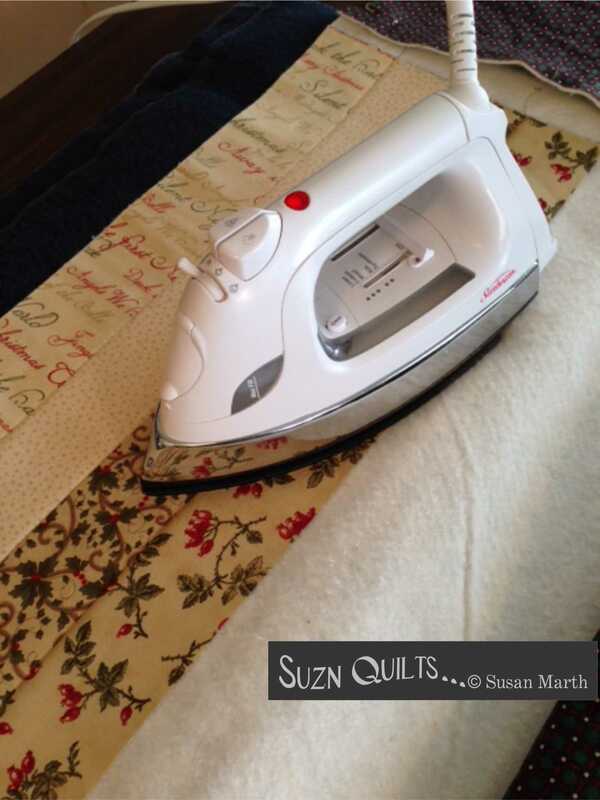 I love using a stripe fabric for bias binding. It creates a nice barber pole effect around the perimeter. How cute is this hanger? I used an antique-looking twill measuring tape ribbon for the loop. 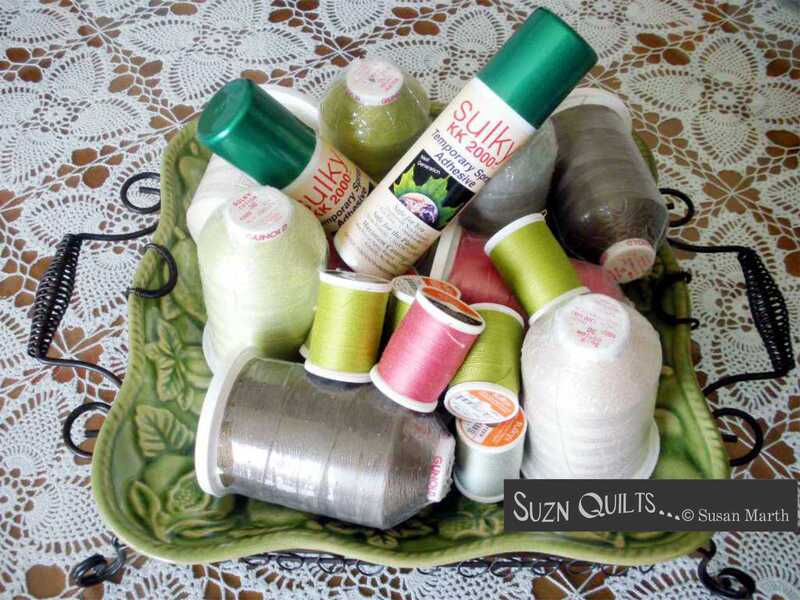 You can purchase this twill measuring tape ribbon on my website, $2.00/ yd. Totally cute for a sewist friend, don’t you think? Perhaps you need a secret sister gift idea? Well, you have a special friend or two at the very least! Well, I got busy and forgot to let you see my progress on the latest A Pretty Package, sorry! I finished sewing the strips on and then fused the bow pieces. Next I stitched the applique with my Sulky 12 wt. thread. This is a close-up of the buttonhole stitch. 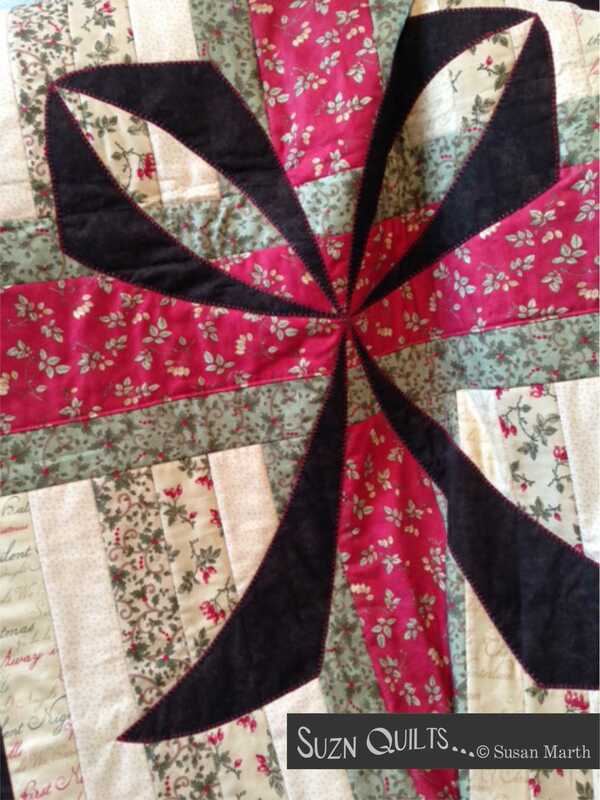 I had a call last week from a quilter whom I met at Houston Festival last fall. 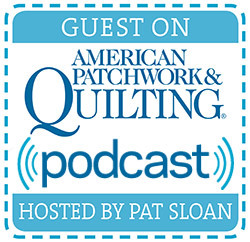 We discussed this stitch that I use almost exclusively for my applique. but she could not find the buttonhole stitch anywhere. Well, it’s actually called a toweling stitch on our machine. but perhaps with a different name! 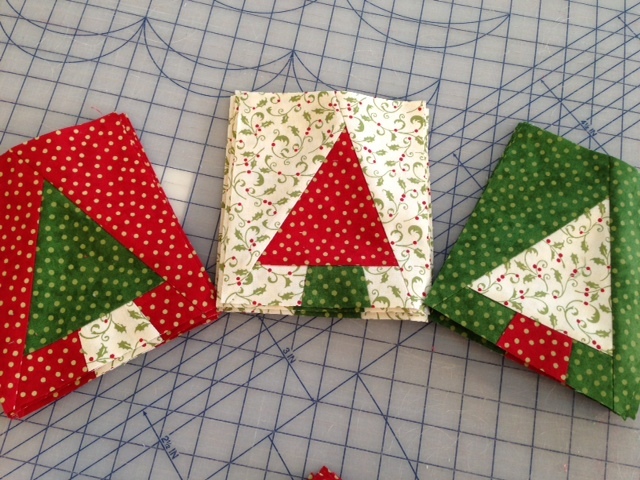 I finished the hand-work on the binding at Rosemary’s tips club yesterday. Here is A Pretty Package in its completed state. It looks pretty good on my favorite rocking chair, don’t you think? 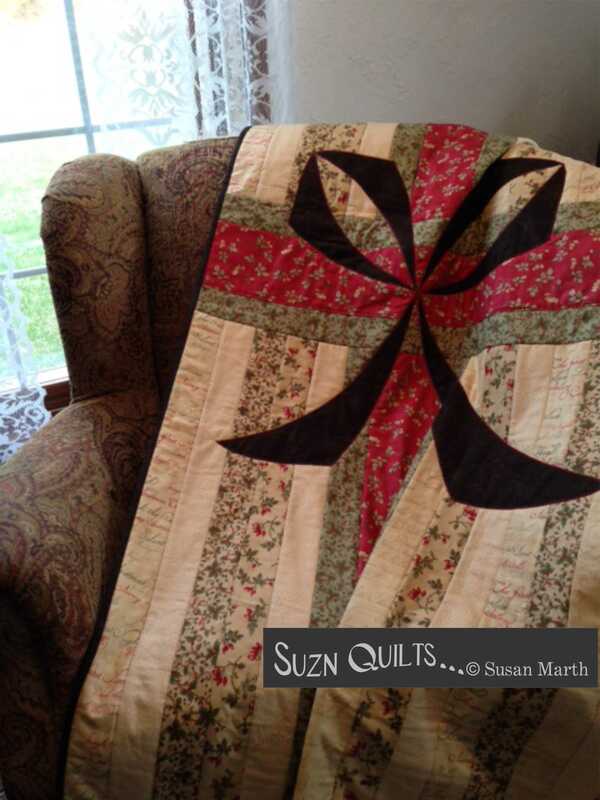 I know where this quilt will land after market next month! Winterlude fits perfectly in my living room. Perhaps it will fit in yours too? You’ll be seeing it in shops in June. 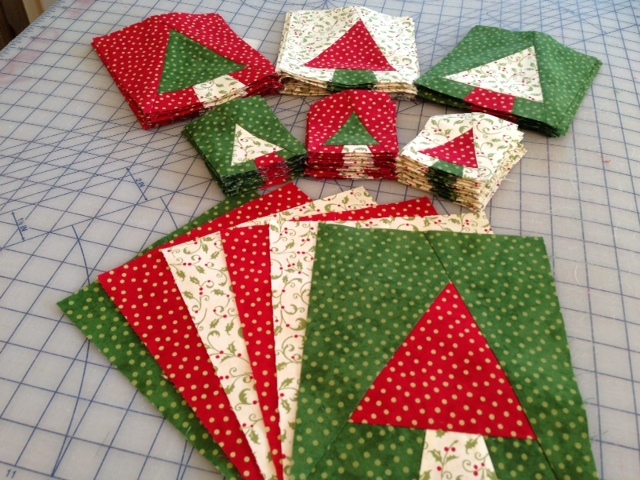 I decided to show my best selling pattern, A Pretty Package, decked out in to too! So far, I’ve prepared the “foundation” and started sewing strips. Layered bath towels are the best pressing surface. 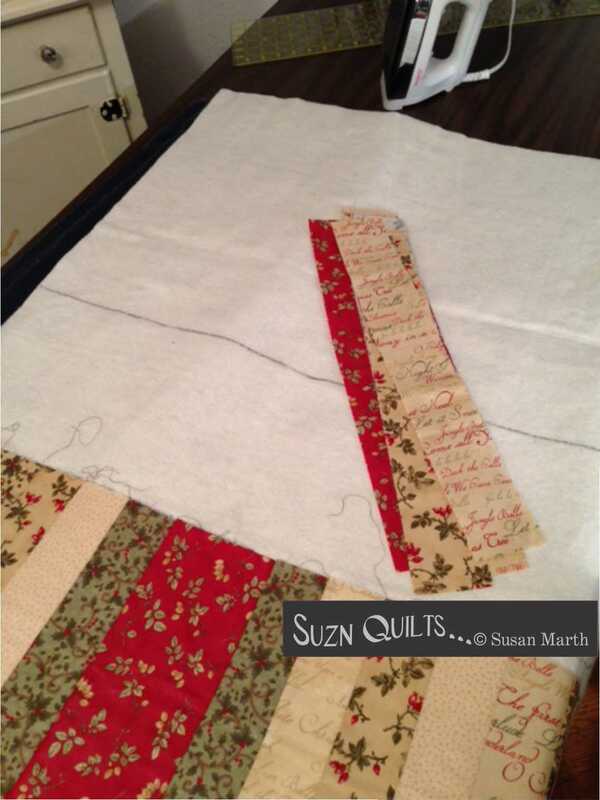 I can press the entire strip at once with no draping & distorting. This keeps them straight all across the quilt. The MOST IMPORTANT step is to measure, measure, measure. 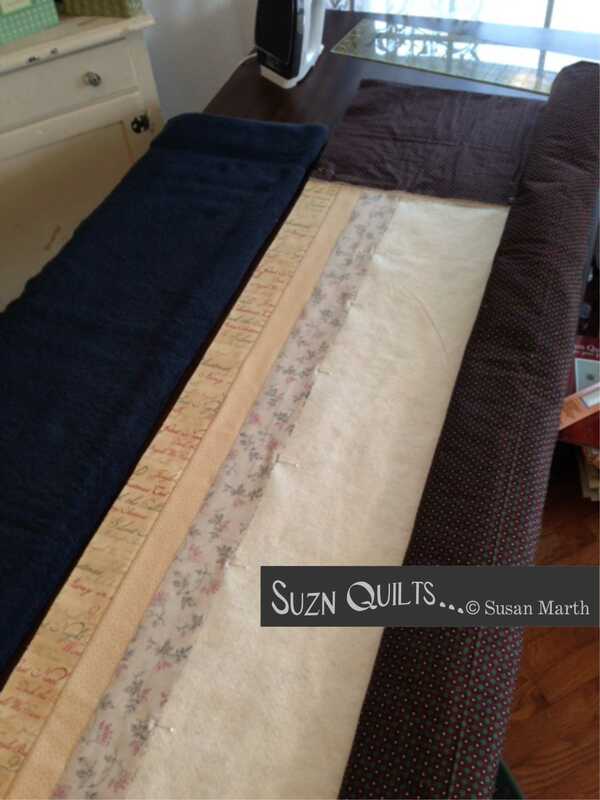 If you sew a strip on crooked, then sew a bunch more strips to it, a little more crooked each time, well… you will have a very crooked quilt indeed! Now I’m prepared to sew the top strips in the same fashion. This is where I am tonight. followed by August: Osage County from Redbox. but as soon as chickadee #2 gets home I’m done for the day. Tune in tomorrow to see the rest of the story! Now for my new book! 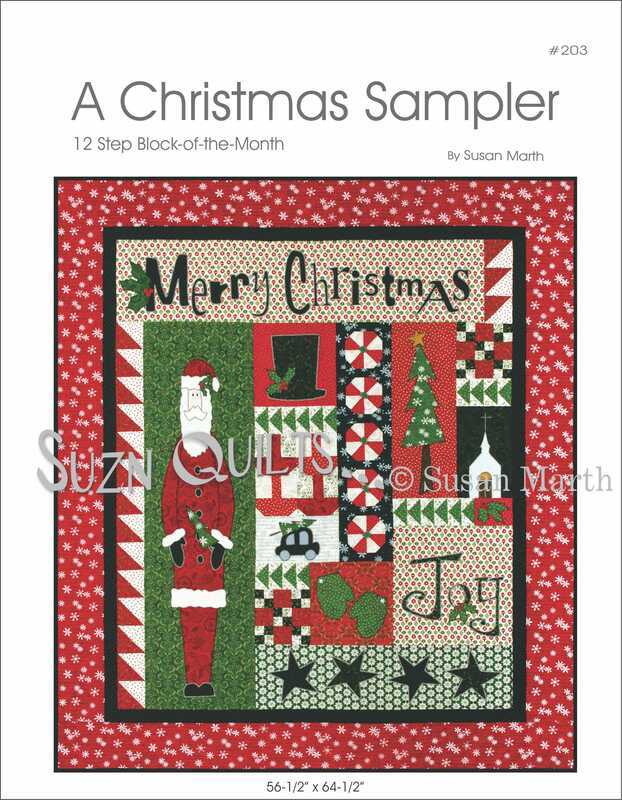 This is my new Christmas Sampler that is written as a 12 step block-of-the-month. I love this pattern and it is only $20! I sold out of these at market last month! 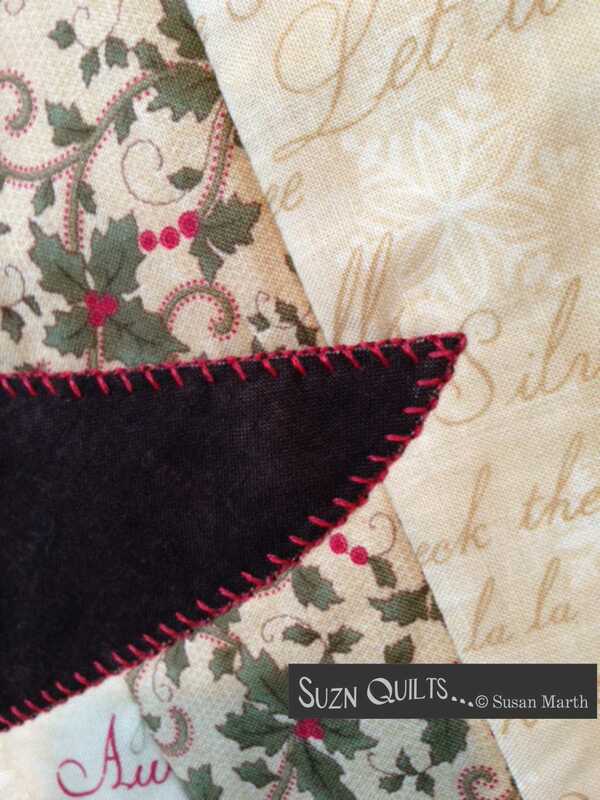 Do I need to tell you that it is made with Deb Strain’s Christmas Countdown by Moda? There is applique and piecing and the instructions are broken down into 12 steps so you won’t be overwhelmed. 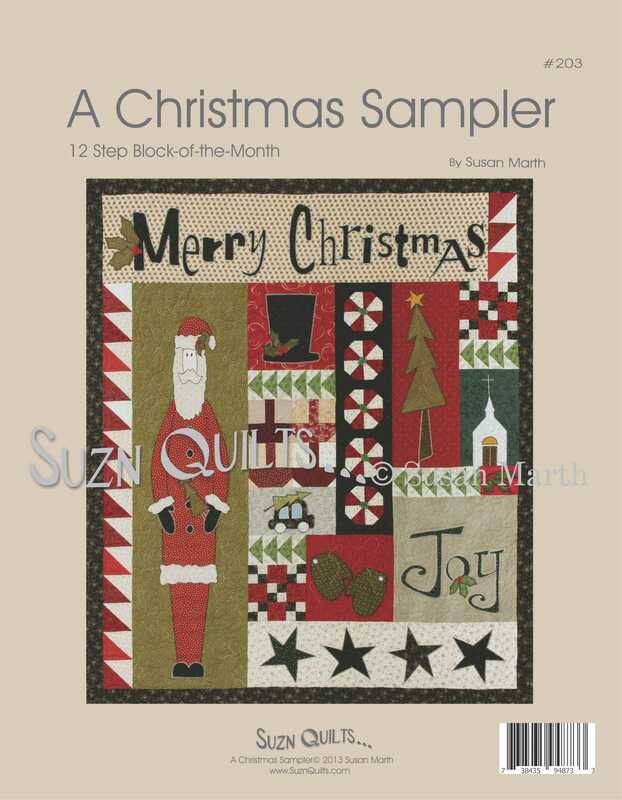 but I know there are a lot of quilters out there that like the option for quilt shops to cut kits for them in the block-of-the-month fashion. Each step is printed on its own page(s) that are perforated for easy tearing out and each applique step has full-size, reversed templates ready to trace. and the last page is devoted to kitting instructions for quilt shops. 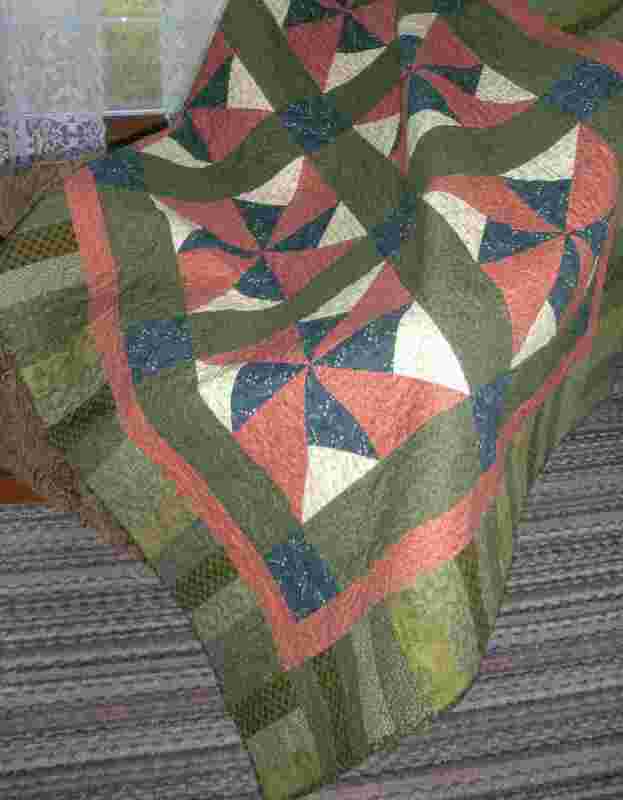 The back cover features another version of the quilt. 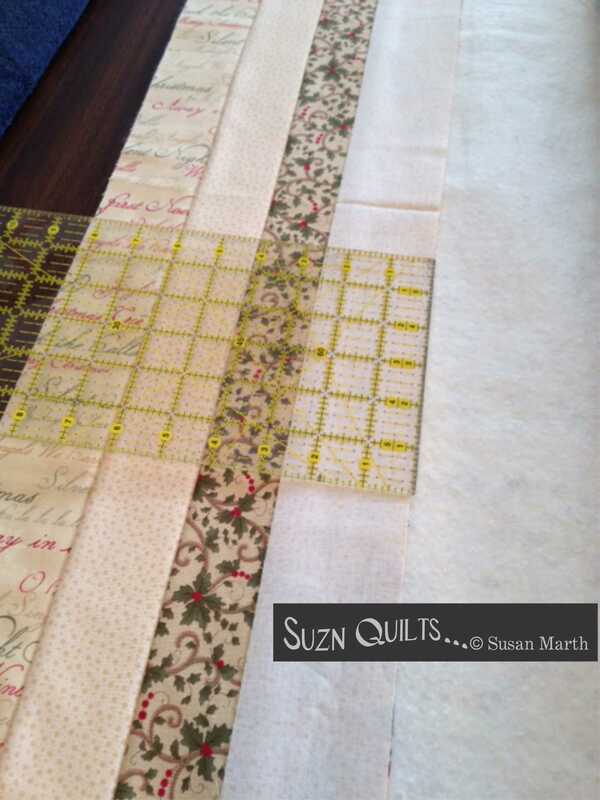 I chose the fabrics for this sample from my stash. It has a more primitive or country feel. and this is the perfect size! and the holly berries and snowflakes are actually more Hillcreek buttons. Have I enticed you yet??? I hope that I have. If your local quilt shop doesn’t have them, all my books and patterns are available on my website. and I enjoyed going back the last couple of months with you remembering my sewing journey! She was rocking someone to sleep and to help lull them she was singing, “La, la. La, la.” over & over. Well, it’s a story that hit my grandma’s funny bone and she told it over and over. I’ve been making a whole forest of trees. 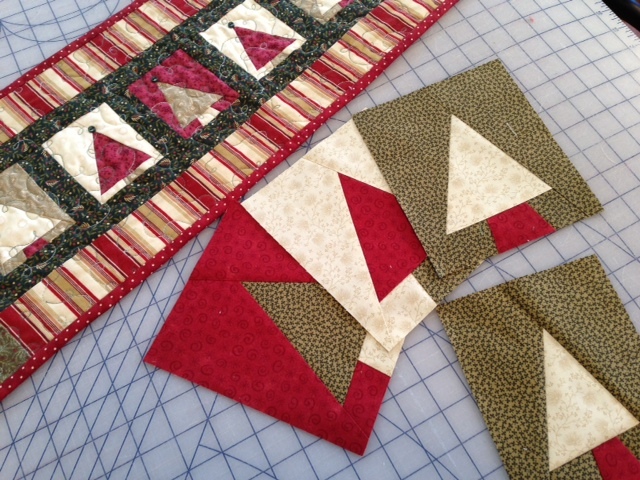 and then designed a few quilts to make with the blocks. Pretty sure I could make trees in my sleep! but that number has yet to be determined. 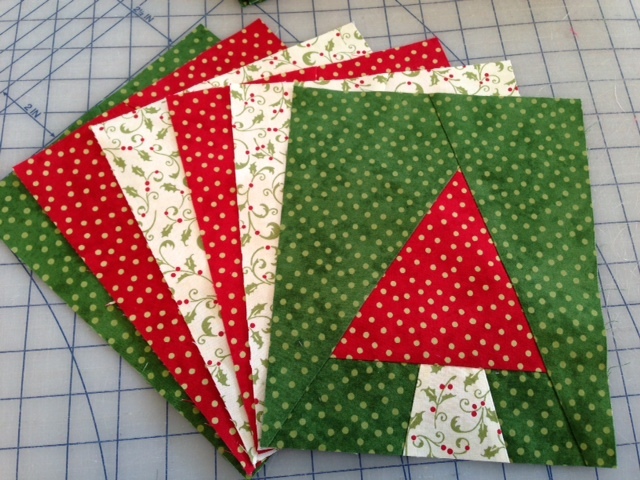 I’ll be putting these into one of my signature Quilt-as-you-go lap quilt patterns. Now to start counting sashing strips. Here you have it, all finished! I didn’t have to stay up all night. I was done before 10:00. Perhaps it will be a gift to me? It sounds good, but so does having a gift for an upcoming birthday. Now, on to Rosemary’s Club and to see what might inspire me next. Umm, Houston’s Fall Market is just 2-1/2 months away. Perhaps I should start dwelling on that?